Some EMBA Programs may require the completion of tests as part of admissions, for example, the Graduate Management Admission Test® (GMAT®). In other EMBA Programs, the GMAT may not be required for admissions consideration. International applicants to U.S.-based programs also may need to complete the Test of English as a Foreign Language® (TOEFL®). The GMAT is the test that many globally recognized programs use to help them determine whether a candidate will be successful in the program. The GMAT exam measures your verbal, quantitative, and analytical writing abilities for study in a graduate business program. The GMAT helps students better understand if they are prepared to enter the program or if they need a refresher in certain areas before classes start. 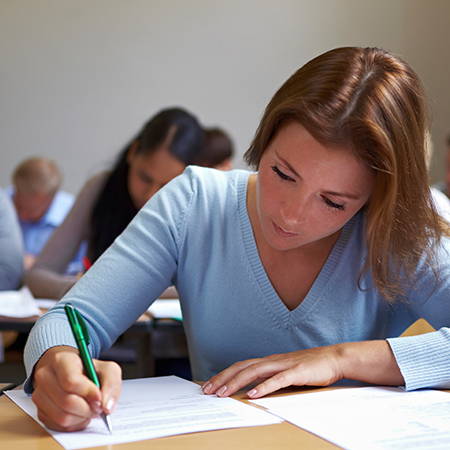 Tackling the GMAT itself may sound daunting to prospective students who haven’t taken a traditional test in some time, but preparing for the test can help remove some of the anxiety. Plan to start two to four months in advance of the test. While the GMAT is one of the most common test requirements, it’s also important to check with EMBA Program admissions staff on any other tests that may be required for the admissions decision. Free GMAT test preparation materials are available, as well as an explanation of how the computer-adaptive test is administered. Other resources include the Office Guide to GMAT Review, as well as verbal and quantitative supplements. Prospective students can find those resources, as well as register to take the GMAT, at www.mba.com.